So I was at a client the other day and they started chatting about PowerBI in Office365. Once again I thought...ah I better get learning again so I have done a quick summary post based on a very helpful video I found online so thanks to the person who created this. A link is available to the entire 1hr video at the bottom of the page. If you come from the old Microsoft Business Intelligence world, must of what is in here will seem familiar. The key is that its now in O365 and is much easier to configure. Users are much more empowered to create queries and reports directly in Excel without having to go near SQL or Reporting services. Reports can be stored in the cloud so are accessible from anywhere :). Power Query allows you to pull in data from other sources into Excel by literally searching the net for it (S&P 500 data for example). This is really neat. There are loads of free datasets available for you to import. This list is growing. You can view them in this post: Search public data (Power Query). Can also pull from SQL, SharePoint, another table. All sources available in excel. Power Query can let merge data from multiple sources. Like them via keys etc. Really nice and easy and available to users who don’t need to know tonnes of SQLServer. PowerPivot will allow you to manipulate further to do sums, counts and filters etc. PowerView is a great way to generate reports dynamically. PowerView allows you to add fields, counts and filters. For example you might have some stats on sales split across country. You can see a map of the sales sizes. This can then be filtered if you want. PowerMap allows the data to be displayed on a 3d map and view it animated over time. Essentially its a video tour of data. Really cool stuff. 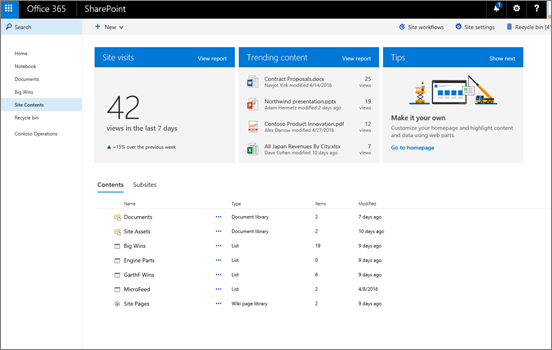 Power BI Sites is added as an app in a SharePoint site. Power BI Sites then edit the whole lot in the browser. You don't need the client. Microsoft has lanced the first public developer preview of the SharePoint Framework. Preview will be updated frequently over upcoming weeks / months. Full support to office 365 tenancies later in the year. You can start building client-side web parts using modern script development tools and the SharePoint Workbench (a new development test surface). You can deploy your client-side web parts to classic web part pages in Office 365 Developer tenants. It Works alongside common scripting frameworks, such as AngularJS, and we’re expanding our tools for these frameworks. For example, you can use React along with components from Office UI Fabric React to quickly create experiences based on the same components we are using in Office 365. SharePoint Framework client-side web parts are good for projects where code is trusted to run directly within SharePoint pages with broad access to SharePoint data. Microsoft have also reiterated their commitment to improving the SharePoint add-in functionality. SharePoint add-ins are great for a variety of other use cases, including support for more fine-grained permission and data access controls, responding to remote events and webhooks, and Office Store distribution. If you still find this a little bit confusing it is ok. I do too but it is still all very new and as is typical to MS they drip feed the information to you as they themselves work out what it all means. SharePoint Online is continually evolving and I am trying to get to grips with it. Microsoft just released a post on the new SharePoint lists, Microsoft Flow and Power apps. New interface on lists makes it easier for users to add columns and do bulk tasks. It is also easier to modify things like properties and metadata. Pretty rapid and will help end users. When a list renders in the browser, a check is conducted to see how customised the list is. If it is felt the page would break due to compatibility issues (i.e the page is customised and the new modern view cant handle it) the page will revert to the old classic list view. I feel this is most needed and I had heard rumours they were going to do this and stops the change breaking your entire library. You can create links to things outside the library easily. This could be a YouTube video for example. That's pretty neat. Custom tool bar actions are still possible like the good old days. Microsoft Flow aims to automate data exchange between systems. An example would be that when an item is added to sales force, something happens in the document library. Its essentially another workflow tool which probably aims to replace SharePoint designer workflow. At face value it looks good and fairly straight forward. Will be interesting to get a good look under the hood. There are extensions for Exchange, SQL, Dynamics, Salesforce, Google, Mail Chimp, Twitter, Wunderlist and more. Powerapps helps create apps for lists which work on any device, especially mobile apps. You hace open an app from the desktop on your iphone. Once again this is quite easy and looks really cool. We have to bare in mind that this is all taken from a Microsoft Article. Have fun and never stop learning. I just found out that there is a new site content page online. It hasnt been rolled out yet but I'm sure the good people at Microsoft will be pushing it shortly. The changed to appear to be as menacing as the ones in the new look document libraries but worth noting anyway. So over the last few years we have been seeing a shift from On-Premise solutions to Cloud solutions. At the same time Office 365 has really been taking off and Microsoft are adding more and more features to their offering as time passes. In April 2016 I was promoted to "Head of Cloud Productivity Tools". A grand title in itself however what is it? This is something we are still determining however it means that I have been having to build on my skills a SharePoint Consultant and make them pretty hot as being an Office 365 consultant. With this in mind I am hoping to generate some value adding content to www.sharepointshowboat.com which relates not only to SharePoint but also Office 365. Office 365 modern document library extensibility. It has been such a long time since my last post but I really wanted to get the ball rolling again and start adding some value. Things have been changing a lot and recently there has been a lot of discussion about the new modern library views in Office 365. We have been concerned that the they break existing customisations and are limited but a statement from Microsoft suggests that they are fully committed to making things work appropriately. Now if they could only stop releasing these things with bugs in we might actually be on to something.